Do we want our churches to clearly proclaim the truth and power of the gospel of Christ or do we prefer it to be a Community Center where people gather for social events/entertainment? The culture has quite a bit of those already. Something is missing and we know what it is. Are we willing to be made willing by a gracious God to speak the Word with boldness and courage? Or shall we continue to fold to give an ever changing popular culture “relevance” without the fire of truth? Now this remains: Do we serve and please Christ our Savior? Or do we lust too heartily for acceptance from a culture that demands we become more like them — while cutting, diluting, muffling, softening — and yes, compromising – changing the gospel of Christ — even begging a lost culture to accept us as an almost bearable rabble slightly tolerated in their self-preferred fiefdom. To fit in or be ridiculed and shunned. I have made my choice and I will stand firm in that choice. Eternity is in the balance. Not only for us, but for the lost who recognize their need and are desperately searching for a clear alternative to all they have seen within a pop culture blindly seeking for they–know–not–what. It is of most preeminence we do not forsake our First Love! These are the words of him who holds the seven stars in his right hand and walks among the seven golden lampstands. 2 I know your deeds,your hard work and your perseverance. I know that you cannot tolerate wicked people, that you have tested those who claim to be apostles but are not, and have found them false. 3 You have persevered and have endured hardships for my name, and have not grown weary. 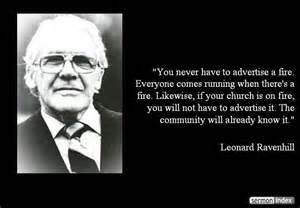 Leonard Ravenhill was an English Christian evangelist and author who focused on the subjects of prayer and revival. He is best known for challenging western evangelicalism to compare itself to the early Christian Church as chronicled in the Book of Acts. Pastor Ravenhill has said it takes sacrifice to bring the Holy Spirit to inflame the gospel of Christ. When that happens people will come from miles around to see the flame that does not consume. No gewgaws, fancy programs, no glittering media presentations –and no watered down message. Just the gospel of Jesus Christ preached in truth and with passion. 31 After they prayed, the place where they were meeting was shaken.And they were all filled with the Holy Spirit and spoke the word of God boldly. Let us preach the one true gospel of Christ with the same courage and boldness that the Spirit of Jesus gave to the Apostles! Nothing more can be added to give the message either more power or attraction. Those who need the Savior need a clear alternative. Not a glossed-over sameness that the world offers. Blessings, ~g.w. Amen and again, Amen. The beauty and simplicity of truth! Thanks.